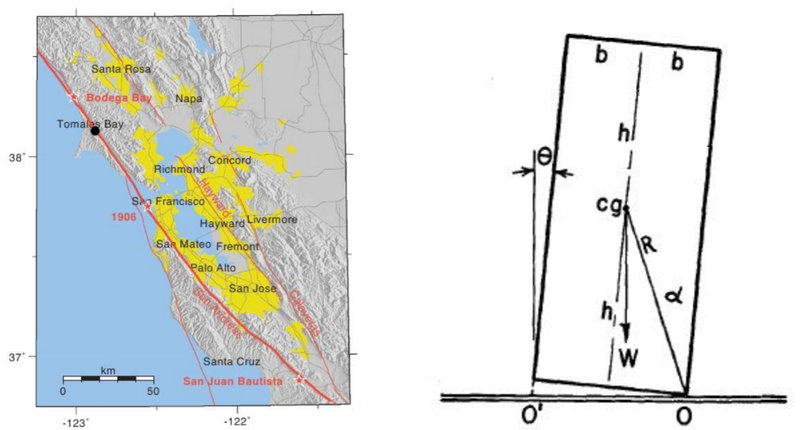 Home Innovation How Can An Overturned Train Lead To Better Earthquake Hazard Predictions? A new study uses a train knocked over in 1906 to check the accuracy of modern earthquake simulations. The study models how much the ground has to shake in order to knock over a narrow gauge locomotive sitting on the tracks — which is exactly what happened on a side track near Point Reyes Station, north of San Francisco, when a massive earthquake struck San Francisco on the morning of Wednesday, April 18, 1906. According to eyewitnesses, the conductor had just climbed back aboard the train after refueling. “[T]he train gave a great lurch to the east, followed by another to the west, which threw the whole train on its side,” said one bystander. “The astonished conductor dropped off as it went over, and atthe sight of the falling chimneys and breaking windows of the station, he understood that it was the Tremblor.” The fireman, whose job it was to tend the fire that drove the locomotive’s powerful steam engine, took a photograph of the train lying on its side, giving us a more detailed look at how it fell. Caltech geophysicist Swetha Veeraraghavan and her colleagues used all that information, along with records of the size and weight of the locomotive, to simulate how much (and in what direction) the ground would have to shake to make the train fall over in exactly the way the witnesses and the photo say it did. They even accounted for the fact that the train, because it was sitting on rails, couldn’t actually slide from side to side across the ground if it was pushed in that direction. Geophysicists have already used detailed computer simulations to model the effects of the 1906 quake, based on what we already know about how seismic waves move through the Earth’s crust and the composition of the ground under northern California. Those simulations suggest how much the ground might have moved at specific locations around the Bay Area, what the quake might have felt like, and how much damage it should have done to buildings and roads. That’s not mere historical triva — understanding how a major earthquake like the 1906 disaster impacts different areas can help modern disaster planners prepare buildings, infrastructure, and people for the next big quake. Because so much is riding on those simulations, it’s important for disaster planners and scientists to know how accurate they are. That’s where the overturned train comes in handy. The best way to “sanity check” (as Veeraraghavan and her colleagues put it in their paper) simulations is by checking how well those simulations match what actually happened on the ground in April 1906. But chances to fact-check are few and far between, because today’s network of seismic monitoring stations wasn’t in place yet. The closest records of ground motion during the 1906 quake came from a station 35km (21.7 miles) from the San Andreas Fault, whose rupture shook the ground that morning — and which still threatens the West Coast. “With the limited availability of ground motion records for large earthquakes, these eyewitness observations become critical data points that lend credibility to these large earthquake simulations,” said Veeraraghavan in a statement to the press. The image on the left shows the San Andreas fault in red, with potential hypocenters for the 1906 quake. The image on the right is the mathematical model of a turn-of-the-century locomotive. Veeraraghavan and her colleagues used their virtual model train — which they represented as a long rectangle 3.76m (12.34 feet) tall and 0.91m (2.99 feet) wide, because physicists love working with simple shapes — to calculate how fast the ground beneath the train moved (its velocity), and how quickly it changed velocity as the seismic waves passed through it (its acceleration) in order to topple the train and have it land the way it did. They compared those results with the predictions of three computer simulations of the quake, carried out in a 2008 study — and it turned out that all three simulations could have knocked the train over exactly as it actually fell. That means the simulations being used to model the 1906 quake, and predict the effects of future big ones, are accurate — which is good news for disaster planners and Bay Area residents. And the train also agrees with the 2008 computer models about the underground center, or hypocenter, of the quake. In order for the locomotive to tip east before falling to the west, Veeraraghavan and her colleagues say, the quake must have been centered somewhere south of Point Reyes, perhaps off the coast of San Francisco and San Juan Bautista.